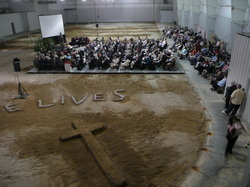 Easter Service 2008. Our first service. In February of 2008, after much prayer, Twentieth Street Baptist and Beverly Hill Baptist joined together to become one church. Not always an easy task, the two congregations coming together was helped by historical ties. Beverly Hills Baptist started as a church plant of Twentieth Street Baptist and Baptist Temple. We bought an abandoned ice skating rink as our new location with the prayer "Ok God, what would you have us do?" Since then we have grown, and we continue to grow as a community of faith, passionate about our Lord. New Baptist remains affiliated with the Guyandotte Baptist Association, the West Virginia Baptist Convention and American Baptist Churches USA. We are a blended church, worshiping in a traditional/contemporary style. In any service you may hear songs and music from the old-time Baptist song book or the top-20 contemporary Christian music countdown. In 1888, the Fifth Avenue Baptist Church of Huntington organized a mission Sunday School which met at Twentieth Street and Fifth Avenue. On March 14, 1892, a meeting was called to complete the organization of the Twentieth Street Baptist Church, with 143 charter members. At that time, the Church property consisted of a frame building on two lots valued at $2000. Early pastors were the Revs. A. G. Loving, W. D. Ellsworth, W. J. Cooke, and B. F. Caudill. A red brick building was erected during Dr. Caudill's pastorate. Dr. Caudill was followed by Dr. J. J. Cook and the Rev. C. E. Griffin, who remained until 1922 when he resigned to help organize the Baptist Temple. Other churches which we helped organize were: Highlawn, Walnut Hills, Beverly Hills, and Pea Ridge Baptist churches. Ground was broken for the final building May, 1926. During the years of the Great Depression, hot meals were cooked and sold, quilts were made and sold, and ice cream socials held. The money thus raised kept the Church from defaulting on its mortgage though at one time we were six months behind in paying the pastor's salary. In 1936, Dr. Cornelius Bowles became pastor. During his tenure, the City of Huntington was hit with two massive floods putting our first floor under water. Dr. Joseph Hakes was followed by Dr. William Fox pastored the Church in the 40s. During WWII, we had 125 men and women who served in the armed forces of our country. Five gold stars were placed in our service flag. 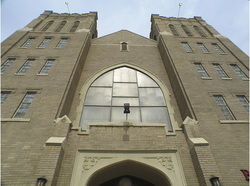 In 1952, the Church voted to erect a new educational building next door to the main building. In 1956, Dr. Fox resigned and in March, 1957, the Rev. A. Melvin Hyers became pastor. He retired in 1970, and Dr. Neil W. Hoppe came to us November, 1971. There were only three times the doors were not open for services: once during the flood of 1913, once during the 1937 flood, and January 22, 1978, due to extreme and unusually heavy snow. Our Men's Radio Broadcast still went on, however. Five brave souls showed up to run it. In March, 1992, we celebrated our Centennial with the opening of the Church cornerstone. The Rev. Paul Fulks became pastor in 1992 followed in August, 1995 by the Rev. Don Walker. In February, 2008 we joined with Beverly Hills Baptist Church to become New Baptist Church. 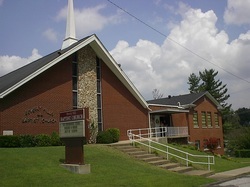 Beverly Hills Baptist Church began as a missionary endeavor of the West Virginia Baptist Convention, upon the belief that there was a pressing need for a Baptist Church in the rapidly developing southeasterly portion of the City of Huntington. Baptist families residing in the area were surveyed to determine whether they would be willing to leave the churches of which they were members to start a new church. In response, on September 21, 1947, thirty-one persons gathered at Peyton Elementary School and expressed interest in establishing a Baptist Church. In the following weeks they met regularly for worship at Peyton School and in the gymnasium at Gallaher Elementary School where, on February 8, 1948, the Beverly Hills Baptist Church was officially organized, with twenty-two charter members. Rev. J. Cecil Jones served as temporary pastor until Rev. Stanley Beaumont was called and installed as first permanent pastor on January 1, 1949. That year, land for a building site was purchased at Linden Circle and North Terrace and on September 21, 1950, the first level of an educational unit was completed. Other additions to the educational unit were completed in 1952 and 1957, and the long anticipated permanent sanctuary was completed and dedicated in 1975. The church grew in spirit and in numbers under the leadership of nine dedicated pastors until on February 1, 2008, in a giant leap of faith, Beverly Hills Baptist Church and Twentieth Street Baptist Church united to form New Baptist Church.